I know no matter what I say about this topic someone is going to be offended, upset, or have the exception that they think proves the rule. Given that, let me just apologize in advance and say that I’m not telling you what is better for you or your cat, just trying to present the discussion. If you chat with veterinarians in a city like San Francisco, you’ll likely hear that it’s better to have an indoor only cat. This is also the view of the American Veterinary Medical Association (AVMA.) The basis for this position is pretty straightforward: there tend to be less cars, other cats, dogs, coyotes and other hazards for your cat in your house than there are outside your house. In addition, indoor cats are less likely to be exposed to infectious diseases such as feline leukemia virus (FelV) and feline immunodeficiency virus (FIV), tend to live longer and generally (but not always) remain healthier. So, given this, why have an outdoor cat? In some cases indoor-only cats act out, trashing furniture or not using the litter box. In other cases indoor-only cats can gain weight if their lifestyle is too sedentary and involves constant grazing at the food bowl. Like in humans, weight gain, especially if it gets extreme, can predispose a cat to diabetes. While in many cases a change in food, feeding (not “free feeding”), adding litter boxes or changing litter and ensuring that you cat has access to a scratching post can address these issues. Put a collar on and micro-chip your cat.Interestingly, dogs are much more likely to be microchipped than cats even though cats are outside unsupervised more often than dogs. Keep your cat up to date on vaccines and other preventive steps including flea abatement. Bring your cat in at night. Where do you come down on this debate? Indoor or outdoor and why? Pet Camp Cat Safari is a one of a kind cat care facility in the Presidio Heights neighborhood of San Francisco. If you’re a cat parent and want your cat to explore the great “outdoors” in a safe environment, consider our Safari Solarium! 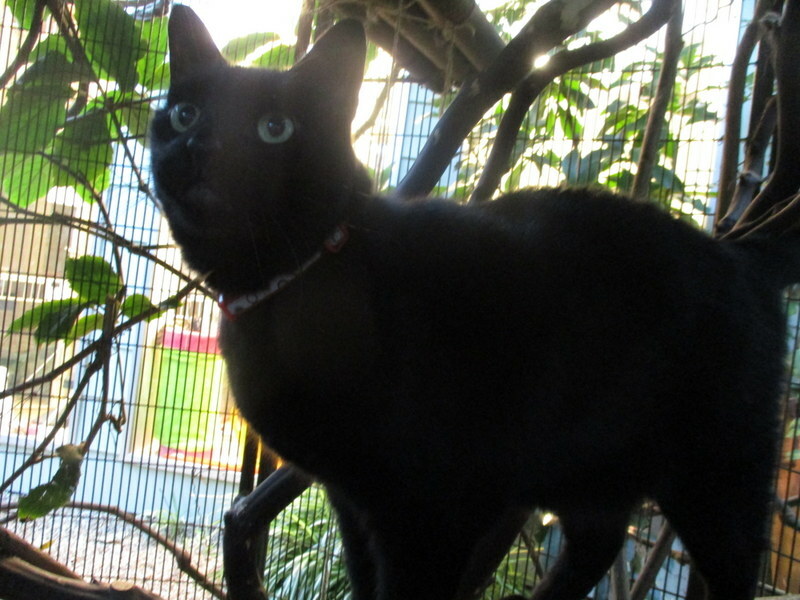 This 500 square foot greenhouse is attached to Cat Safari and provides urban cats the change to explore the great “outdoors” while being safe from all the hazardous of the street of San Francisco.